Goa chief minister Manohar Parrikar died in Panaji on Sunday after a prolonged pancreatic ailment. He was 63. He served as four-time Goa chief minister and had a three-year-long stint as Defence Minister in the Narendra Modi-led cabinet. Parrikar, often referred to as 'common man's CM', was being treated at the All India Institutes of Medical Sciences (AIIMS) in New Delhi. Born in Goa's Mapusa in 1955, Parrikar joined the RSS during his school days. He studied at Loyola High School, Margao. He completed his secondary education in Marathi and went on to graduate in metallurgical engineering from the Indian Institute of Technology, Bombay in 1978. He is the first IIT alumnus to serve as MLA of an Indian state. He pursued metallurgical engineering from IIT-Bombay and graduated in the year 1978. As a sanghchalak in Mapusa, in the 1990s, he was heavily involved in spreading the Ram Janmabhoomi movement in Goa. 1991: An RSS pracharak from Goa, Parrikar's electoral debut was unsuccessful when he was defeated by Congress candidate Harish Zantye in the 1991 Lok Sabha polls. 2000: Parrikar became the chief minister for the first time on October 24, 2000. However, his tenure lasted only till February 27, 2002. 2002: On June 5, 2002, he was re-elected and became the chief minister for a second time. 2005: On January 29, 2005, his government was reduced to a minority in the assembly after four BJP MLAs resigned from the House. However, Parrikar proved his majority in the house the next month. 2007: The Parrikar-led BJP was defeated in the Goa state elections by the Congress, led by Digambar Kamat, a former BJP leader. 2012: His party was victorious once again after the BJP and its allies won twenty-four seats against Congress' nine in the Goa Assembly Elections held in March 2012. 2013: Parrikar proposed the name of Narendra Modi as the prime ministerial candidate before the 2013 BJP parliamentary elections convention in Goa. 2014: BJP won both the seats in Goa in the 2014 Lok Sabha Elections. Parrikar was persuaded by PM Modi to join the central government as defence minister. Initially reluctant to leave Goa, he stayed in Delhi from November 2014 to March 2017 to serve under the NDA government. He was succeeded by Laxmikant Parsekar as Goa's CM. He entered the parliament after he was choosen as the party's candidate for the Rajya Sabha seat from Uttar Pradesh. 2017: Parrikar left the national capital and was sworn in as the CM of Goa on March 14, 2017. 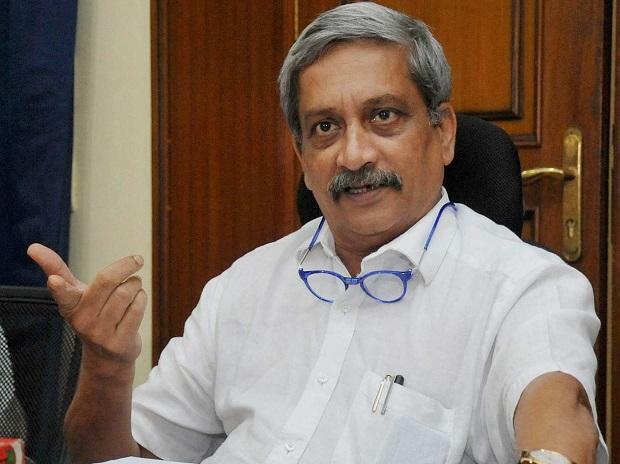 The Maharashtrawadi Gomantak Party, one of the parties who allied with BJP in Goa after election results were announced, had said that it would extend support to the BJP only if Defence Minister Manohar Parrikar was brought back to the state as chief minister. In the 40-member state assembly, the Parrikar government has the support of 23 MLAs. These comprise 14 BJP MLAs, three each from the Goa Forward Party and MGP, as well as, three independents. The opposition Congress is the single largest party in the Goa assembly with 16 MLAs. 2018: In September 2018, Parrikar was admitted to AIIMS, New Delhi. The opposition in Goa raised questions over the stability of the government because of Parrikar's illness. All 16 Congress legislators in Goa assembly met Governor Mridula Sinha on September 19 and demanded a floor test by the BJP-led government, after Parrikar was admitted to AIIMS. On the same day, BJP president Amit Shah met party leaders in Goa to work out a plan and prevent any political crisis after the opposition Congress staked claim to power.